Ganesha's Birthday falls on Thursday 13th Sept 2Ø18. Birthday of the Gods and Goddesses are important as the stars resided by the particular deity is close to the Earth plane on that day and it provides you with an opportunity to establish a heart connection with the deity. Worshiping Ganesha on his birthday will give you mental strength and bring in prosperity. Ganesha worship is one of the oldest form of practice in Hinduism and the most popular deity in India. He has been prayed to, worshiped and adored in one form or another since time began; and time itself began with His creation. He, above all others, is the God, the great Mahadeva, to be invoked before every act and especially worshiped and prayed to when changes occur in our lives as we move from the old established patterns into new ones. Lord Ganesha is always there to steady our minds and open the proper doors as we evolve and progress. He never, ever fails. He is always there for us when we need Him. Ganesha represents the wisdom tradition. He doesn’t care about logical understanding. He is associated with buthi, highest form of intelligence. There is a story how he enter a competition with his brother Muruga. Both of them try to go around the universe. Muruga wanted to do it in the harder way going around the universe with his vehicle the peacock. But Ganesha just go around Shiva and Parvathi and profound to asked very quikly. He represent a short cut by doing something very small but gaining tremendous amount of result. He is revered with the title Aadhi Moola Kadavul, means “The God of the Beginning”. Fitted with an elephant head and a human body, this God uses the mouse as his vehicle to move around. Toppukaranam (squatting and standing up exercise) is known to make him happy. He is placed at the right in a Shiva temple to symbolize that he is our right brain (memory/emotional brain) ruler. He is prayed specially before the beginning of all actions including any new rituals and prayer services. He represents the Pranava Manthra "OM" and is called "Pranava Swaroopa." There are several days in the month according to the Phase of the moon or star position which are important for each of the Deity we worship. The Fourth day after New Moon every month [Sukla paksham] - Chathurthi is very important for Ganesha. The Fourth day after the Full moon day [Krishna paksham] is called Sankatahara Chathurthi day and is auspicious for special pooja and Havan [Homam] for Ganesha. The Sukla Chathurthi day of the Tamil month Aavani is celebrated as Ganesha Chathurthi day. - Lord Ganesha is closely associated with Ketu and is the planetary Overlord of Ketu. - Lord Ganesha when prayed to also gives the Moksham (enlightenment) and obtains all the above through Ketu. - In Tantric Astrology when Ketu occupy in your 12th house, then it considered this is your last birth. 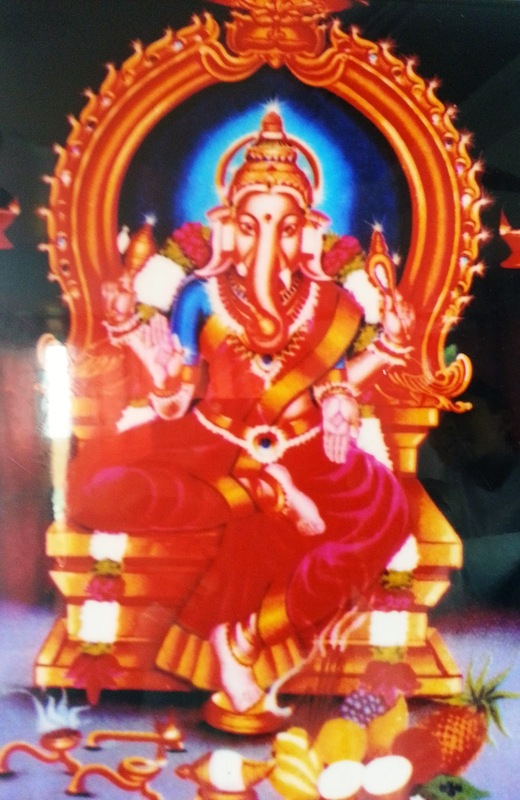 - In Ganesha's right hand He will hold ankusham (Axe) to cut the rope of rebirth that He hold in His left hand. - So Lord Ganesha is Moksham giver God who can liberate you from Human Kingdom to Angelic Kingdom (Deva Logam). Vinayaka, Vi-nayaka, the one born without a husband. And she loves him. He is the lord of the Muladhara Chakra, the base chakra, the guardian who will leads us on that occult journey called Tantra, that reveals the mysteries of the Goddess. Lord Ganesha can comprehend the language of sound which we speak. He is the deity who converts the language of sound into that of light. Most of the other deities can understand only the language of light. In art, when Shiva is half a woman, the Goddess makes up the left half of his form while he retains the right half. On the left is the heart, of intuition, of feeling. The right side, the opposite side, is the side of the head, of the thinking, of intellect and of the soul. When Ganesha’s trunk points to his heart, he is closer to his mother, the sensual Goddess, who embraces material reality. But when it points to the right, he is closer to his father, the intellectual mendicant who wants to shut his eyes to the world. Ganesha’s image with trunk pointing to his heart is popular in households because it shows a Ganesha comfortable with the world of matter, senses and emotions. Ganesha with his trunk curled to his right, is more ascetic in nature, hence not kept inside homes, and preferably enshrined in temples. The mouse (Mushika or Akhu) represents the ego, the mind with all of its desires, and the pride of the individual. Ganesha, riding atop the mouse, becomes the master (and not the slave) of these tendencies, indicating the power that the intellect and the discriminative faculties have over the mind. Moreover, the mouse (extremely voracious by nature) is often depicted next to a plate of sweets with his eyes turned toward Ganesha while he tightly holds on to a morsel of food between his paws, as if expecting an order from Ganesha. This represents the mind which has been completely subordinated to the superior faculty of the intellect, the mind under strict supervision, which fixes Ganesha and does not approach the food unless it has permission. Shiva and Parvati used to play with two sons, Ganesh and Kartikeya. The gods had given them a marvelous fruit. Each boy wanted to get it for him alone. "My parents Shiva and Shakti are the Whole Universe. In Them is located the World. He do not need to go further". Of course, he won the contest, ... and the fruit. This legend emphasizes the importance of cleverness; Ganesh is a strong symbol of this quality which is always the best against force, speed or physical strength. Lord Ganesha contain powerful, elementary energies from the earliest time of creation. If one knows how to invoke Ganesha it will be beneficial energy to help you make the 'impossible' possible. This will give you the power to attract successes in all that you do. Chant "Hmmm / Om Lam Lambodharaaya Namaha" everyday one hour before Sun rise (after cold shower) by focusing on Mooladhara Chakra, it awakens your Kundalini Shakti. You may start this practice from Lord Ganesha's birthday onwards. Chant 1Ø8 times loudly for 48 days then reduce your chanting to 18 times after 48 days onwards but this time you should chant mentally. By awakening Mooladhara chakra one can remove blocks in every area of life: making money, health, especially relationships and etc. with the blessings of Lord Ganesha the over Lord of the Mooladhara chakra. When we activate the energy of the Soul by chanting this mantra, Lord Ganesha will bless us with the kind of knowledge that will completely remove our tendency to be reborn. In this lifetime we are all fortunate enough to be born as human beings, but none of us can be sure of this good fortune in our future lives. Who knows which body our Soul may inhabit then – it could even be the body of an animal or insect. This will be decided by the kind of karma we generate through our thoughts, words and actions. However, if we awaken the energy of our Soul, we will only transmigrate from a human body to a divine body and we will unite with God. This is the science of the Soul and the essence of life. indicators of destiny and fate, symbolizing our entrapment in this physical plane. These shadow planets control us by our desires. Our desires are our karmas. Our destiny is to release the chains this world has cast upon us. It is like the serpent’s bite. The poisonous venom intoxicates us into this world. or Maya. Ketu is the bringer of enlightenment through the realization of this truth. Ketu is the release of this world. represent the north and south nodes of the moon. they affect the happiness and success factors of life. Worshiping Rahu and Ketu on their special day will liberate you from misfortunes, negative forces and other perils of your life. 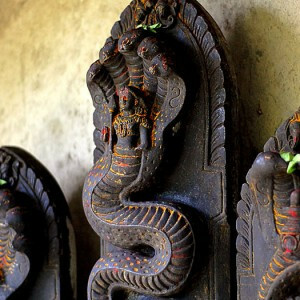 Naga Panchami is that special occasion for you to transform your life for the better. On the day of Naga Panchami, your prayers will appease Rahu and Ketu; they in turn will heal your relationship problems, career disturbances and gift you with a hassle free life. What to do on Naga Panchami Day? spouse and offer prayers to the devatas. 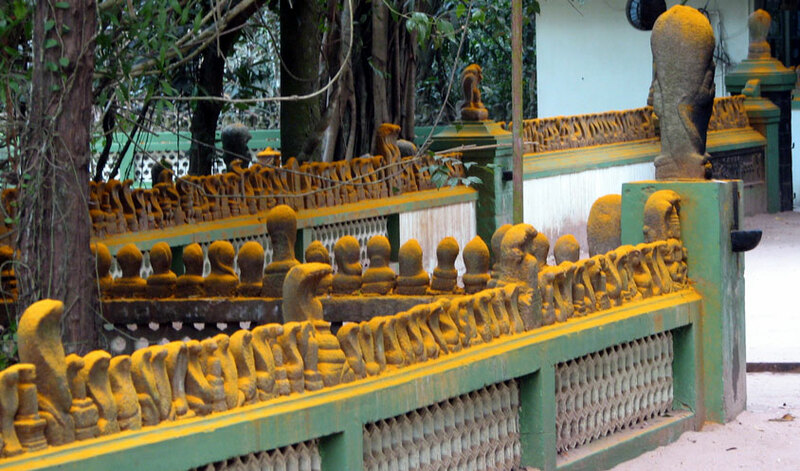 There are several pilgrim centers considered as Naga Kshethras where, Serpent God is worshipped as a presiding Deity. 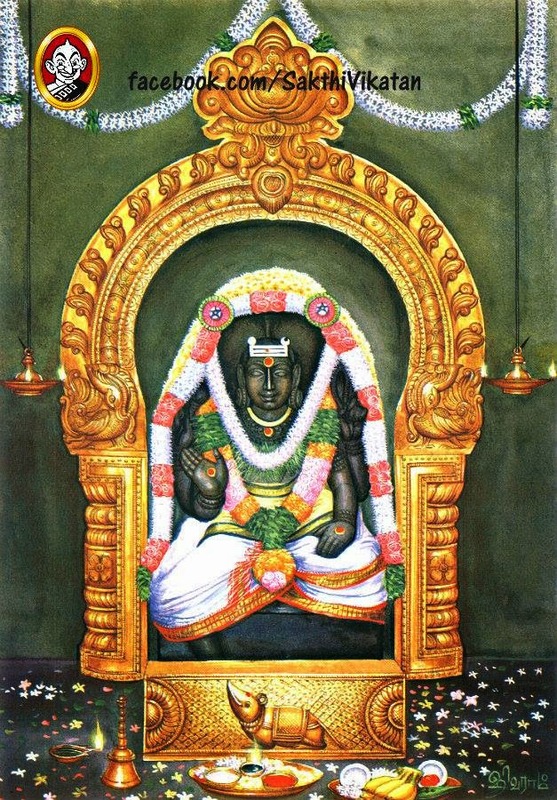 Some of the famous and ancient Naga Kshethras associated with puranic legends are Sri Kukke Subramanya in South Canara in Karnataka State, Sri Kshethra Kudupu near Mangalore, Sri Kalahasthi near Tirupathi, Ghaati Subramanya near Doddabalapur in Karnataka, Thirunageswaram near Kumbhakonam and Nagerkoil in Tamil Nadu, Manasa Devi temple in Hardwar in Uttar Pradesh, and Nageshwar Jyothirlinga Kshetra near Dwaraka are some of the famous Naga Kshethras. Apart from the above, there are six Subramanya Kshethras in Tamil Nadu viz. Thiruttani, Palani, Tiruchendur, Tirupparakundram, Swami Malai and Pazamudhircholai which are also worshipped as Naga Kshethras. - Parikshit, a descendant of the Pandava kings was very afraid of the snakes and took great pains to avoid them. However, Takshaka the snake took the from of a worm in a fruit and killed the king. Parikshit's son Janamejaya, then undertook a mass sacrifice of the snakes (Näga-Yajna) and wanted to eliminate all the snakes from the earth. At this juncture, the divine forces intervened and stopped the destruction of the species. - The Nagas are a tribe living prominently in the State of Nagaland, in Eastern India. They are said be descendants of a Naga prince killed by Parikshit (see above). 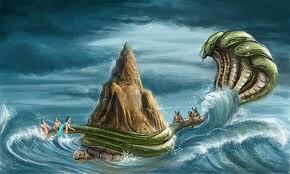 - When an evil serpent Kaliya troubled the village cows, Krishna tamed him and danced on his hood.